The period of the Old Kingdom was ruled by pharaohs from the 3rd to the 8th dynasties although some historians list the 3rd dynasty to the Early Dynastic Period. The accession of 3rd Dynasty of Egypt to the throne marks the height of the Old Kingdom. 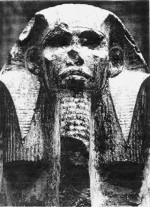 The most important pharaoh of the 3rd dynasty is definitively Djoser (c. 2620-2600 BC) whose power can be still admired in 62 meters high pyramid of Saqqara. The Step Pyramid of Djoser at Saqqara is the oldest Egyptian pyramid and marks the beginning of the Egyptian monumental architecture. Djoser employed architect Imhotep who was also physician, priest and founder of a cult of healing. Imhotep finished the 62 meters high (204 foot) Step pyramid about 2611 BC and was also buried in it. Egyptian monumental architecture achieved zenith during the period of pharaohs of the 4th Dynasty of Egypt: Cheops (Khufu), Khafra, Menkaura (Mycerinus). The architectural achievements of the 4th dynasty which remained an object of admiration until the present days also clearly indicate wealth and highly developed economy as well as close connection political and religious life. The era of the 4th dynasty ended with confusions on the throne about 2465 BC and the decline of power of the pharaohs became evident. The period of the first pharaohs of the 5th dynasty was marked by political-religious changes which resulted in the predominance of the temple of Ra (god of Sun) in Heliopolis. In contrary to former believe that pharaoh is Horus in flesh the new believe considered pharaoh only a son of god but deceased pharaoh became equal to Osiris, god of the dead and underworld by the end of the 5th dynasty. The decline of power of pharaohs became irreversible during the 6th dynasty and by the end of the 8th dynasty the power was de facto in hands of nomarchs who struggled for the Egyptian throne among themselves.